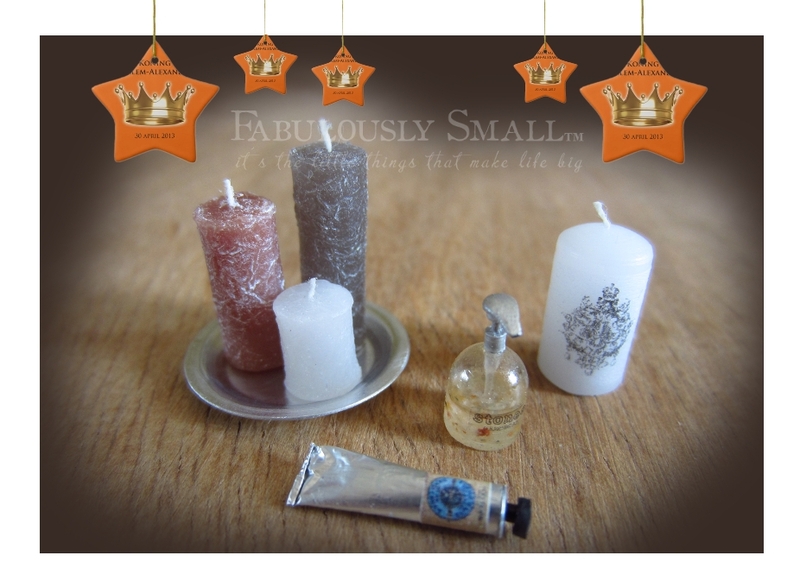 Fabulously Small: giveaway - long live The King ! Who, me ? giveaway - long live The King ! Who, me ? UPDATE: just to let you know I made a new cap, since the one I hade made and is in the giveaway picture, turned out way too big and not good enough and I couldn't make a new one earlier than this. The tube is a bit flatter now (due to putting on the cap while holding the tube and there seems to be an airpocket there which left it more fragile than it should have been doing that..). So this one will be for myself and I will make a new tube for the winner that I just want to be right, with this cap. today is a historic day for The Netherlands: our beloved Queen Beatrix for 33 years passed on the throne to her eldest son, Prince Willem Alexander this morning. He is the first king since 1890, after three queens. He, his wife and 3 daughters are very popular in our country and I think he will make a good king. Although I don't have much with the institute of a kingdom itself , I do love our royal family. That I find very warm and authentic and really add something to our country. Not only because of their genuine and warm personalities, but also because of their great efforts and work in all kinds of very inspiring communityprojects they're really passionate about. Projects that help the less fortunate of our society in all sorts of ways to make them able to make something of their life, despite their challenges. to celebrate this very special occasion, in combination with my last name being "The King" in Dutch - yes, I feel very royal, although I seem to lack every teensy bit of grace & elegance that should go with that :) - ánd to show my appreciation to all of you who take the time to follow my work, I decided this is the perfect moment to have another giveaway. 3) let me know in that same comment if your country has a king, queen or else and - if you could choose - would you like to have a queen or king in your country (or if you already have that, would you want to keep it that way)? And why would or wouldn't you like to have/keep that ? make sure you do this in time. Good luck! I must tell you that I really love your humour. I don't know if I'd like to have one for political reasons but what I like in these countries which have a queen or a king is this nice feeling to belong to the same community, to the same country when this kind of evenement arrives. People seem to be united in the same jubilation and this is great. Long life to your new and beloved king !! Hi Karine, thank you for your compliments :) Ah, yes, I remember (well, not that I was there, but you know) that was not a very happy ending for your kingdom unfortunately... I know what you mean and your English is very understandable! Thank you, and a long life to you too of course (should not just be reserved for kings and me, haha)! I saw the new King and his family on Tv. They looks a beautiful family. In Italy we haven't a King. The last King wasn't a good King, because he left us in the hands of fascism. Now, we have a President of the Republic. I saw in Brazilian newspapers the news of the passing of the throne to Prince. Long life to a Good King! Here in Brazil, we have the President of the Republic. President Dilma Rousseff, is doing a good job, but I disagree with many of her positions as head of the Brazilian nation, I don't like the support it gives some governments of neighboring countries and hypocrisy on the preparations for the World Cup Soccer. Of course I want to join your giveaway! Count me in! Hi Eliana, so nice that the news spread around the world, I never thought things like this (in a small country as ours) are news like that, but I guess it is. Thank you for your input about your President, I can see how someone who does a good job in general can be disappointing in areas too. Hopefully she'll see the light someday and does things differently regarding the World Cup Soccer, but given the enormous amounts of money and power from the soccerleague involved in things like that, I'm afraid she won't (be able to?). What a fantastic giveaway! I would love to participate! I just joined your blog, and published a link on my blog, too! I am originally from the USA-we don´t have a King or Queen. I live in Barcelona. Spain has a King and Queen. I love that our Prince married a regular girl and one day she will be Queen! Hi Keelin, happy you like it so much! Welcome at my blog and thank you for linking my giveaway. Ah, your Prince married a regular girl too? Just like our (now queen) Maxima, who was a normal (Argentinian) girl. I can imagine you look forward to your Prince and his wife becoming King & Queen! Congratulations to your beautiful country and may you all be happy and well! Although pesonally i don't think a King or Queen is needed...it is the business of each nation and the citizens to decide on that! I live in Greece, where there is no King anymore since some decades. Thank you Anna, also for the link on your blog! I think your absolutely right about a King or Queen being not needed, a country can do very well without. If it should be up to a country and the citizens, I'm not sure what to think about that, I guess it makes sense, I think I'm just not sure what that would mean in our country since our government might vote it out (and I would find it difficult to give a short term group of people the power of such a thing), but a majority of the people would want to keep it. So who to decide? But in essence I think you're right. I didn't know Greece once had a King, but I guess a lot of countries did one day. Hello - of course I also want to take part of your giveaway :D Congratulations to your new King! I´m from Bavaria, Germany and we don´t have a king since about a century. I actually can´t say who would be our King/Queen if we still had a monarchy and I think that most people here can easily live without a king. BUT we are eager to see what´s happening to the foreign royal families!!! Ciao, Monique! Partecipo volentieri a questo giveaway divertente! Noi italiani abbiamo votato tanti anni fa (io non ero nata), per sbarazzarci definitivamente dei nostri Reali fuggini durante il Fascismo, peraltro la più antica dinastia europea. I nostri Principi, mai più Re, sono in esilio, ma negli ultimi anni vanno e vengono dall'Italia come meglio credono. La mia famiglia era monarchica. Mi sarebbe piaciuto avere un Re. Spero di vincere le tue "regali" candele&Co! Metto il link nel mio blog. Ciao Blanche, è comprensibile che essi hanno abolito in Italia, secondo le circostanze, quando la monarchia, ma posso anche immaginare che l'idea stessa ancora in grado di parlare. Chi lo sa, ancora una volta e poi in circostanze migliori? Sono contento che ti piace il mio giveaway e grazie per la pubblicazione di un link sul tuo blog! Beautiful giveaway!! Please count me in. We don't have a royal family in the US, but I do like the pagentry and the idea of it. Hi there Brae, consider yourself counted in :) ! It's a nice thing isn't it of a monarchy - if you like that sort of thing, that some people don't like at all too..) - the traditions, the peculiarity of such a family in a golden cage (in which I would never want to live myself I might add..), I get it can have an appeal. Hola Mari, gracias! Creo que será un buen rey, pero el tiempo lo dirá. Heel leuk je giveaway,wil graag meedoen.Ik ben ook heel blij met onze Koning en Koningin.Zet de link op mijn blog. Que hermoso sorteo! Y que buena manera de celebrar a su nuevo rey. Me anotas por favor en tu sorteo? Lo anuncio en mi blog. Hola Rosa Margarita, tengo entendido que se puede utilizar muy bien en sí mismo un presidente :) Yo sé lo que quieres decir por la relación entre la monarquía y la gente como nosotros, y en Inglaterra. Eso tiene alguna eh? Please, I want to participate in your giveaway. It´s very nice!!! Hi Dakota, I thought so too, happy you like it! I'm not a monarchist myself persé, but in a sentimental way I guess, just because we happen to have such a great royal family (at least that's what I think) I'm happy with it/them. You make me curious about the country you live in and what the reality of it is.. but maybe you prefered not to share? Oh Monique, thank you very much for the opportunity. The things you've made are fantastic. Finland has no royalty, only a president, but there was a plan to invite a prince from central Europe to become our king at the beginning of the 1900 before Finland became independent. They even made a crown and a throne, but the plan was never realized. Hi Hanna, you're welcome, thank you for your compliment! How curious that all the preparations for a king never lead to an actual crowning in Finland. Maybe the father of the Prince decided, but the Prince himself was against it and was not to be dragged to Finland with an army of horses? Who knows? Nice peace of history though, thanks for sharing. You have a good may too! Please may I be counted in? I live in the North of Ireland which is part of the United Kingdom which has a Queen. Northern Ireland is a very complicated place but I am of the opinion it is important to me to have a Queen and I see myself as British. It is important to me as I feel more at home in London than I do in Dublin. I think it comes from years of education where we read English Literature and so many were set in London or England. I have just enjoyed watching all the pomp and ceremony in The Netherlands on the News. Lovely to see so many people watching it in the Street. I think it's very sad how things have been in Northern Ireland for so long, it has known too much sorrow and is too torn to be a stable happy place, if I'm not mistaken. I can understand why London appeals so much more, especially when you have tasted the difference for quite some time through your education. Ha, what pomp and ceremony it was huh? It's all part of the show I guess and it makes it special. The people were very cheerful, such a contrast to the riots and problems during the crowning of former Queen Beatrix in 1980. I adore your projects & blog! Please count me in as I am not crafty and could never do what you do! Love it!!! Being American, we don't have the culture of a monarchy and it would not mesh well with our traditions, however short they are as compared to most nations. I do think highly of the Dutch and British monarchies as both are adjusting to pragmatic contemporary issues, particularly Willem and William and Harry. I applaud them for that. Thank you Emily, very nice to read that! That's a nice thing to say about the male royals, and I think you are right. And luckily they haven't lost their humanity either and therefor make mistakes sometimes, but we all make them right? Ha die Luidina! Yes, a King! The girls are adorable, I really like them. I enjoyed the tv-coverage a lot too. I hereby declare you joined in my giveaway :), to stay in the formal manner of the royal event. Glad you like it! And one tutorial about the ornamentcandle is noted! Hi Hannah, really? that's such a coincidence! Well: congratulations then! I saw him in your link, he looked happy and he seems a kind man. I hope he will live long too and that when time comes his daughter will follow in his footsteps. It's great you have the confidence she will! Lovely giveaway, please count me in! Anyway, the media loves to focus on what the British Royal family is up too, so I could imagine having a Queen. Sure thing Kyle, you're in! It was the British King you are talking about I think, that was the king of the US a long time ago? Anyway, I can understand that that wasn't a desirable situation if people disagreed a lot, but from what I know from history a lot of kings made kind of a mess in those times. But to be fair, so have and do a lot of other rulers, nòt being kings. I guess it has to do with power being a difficult thing to use wisely and nowhere near everyone is fit to be a ruler, no matter how much they want to be or think they are. Hola Carmen, sí puede participar, gracias por poner un enlace a su blog. No le importa lo que piensa, pero por lo que entiendo es el rey español (y la monarquía) no es tan popular ya por los escándalos del año pasado, con suerte a su hijo haciendo mucho mejor. Si la monarquía es abolida, al menos, por ahora, yo entiendo que hay manifestaciones que van a hacer esto .. Lástima que desde hace mucho tiempo que la monarquía era muy popular en España. Hola Ana, gracias y agradable que has vuelto. ¿Estás triste que México no tiene rey, si crees que es tan grande? Thank yuo Micaela and for putting a link on your blog! I can understand that a President is just fine, too bad the one you have now isn't too great though, hopefully next one will be better. Well, I'm not so sure about royalty in every family tree, I saw a Dutch programme about the genealogy's of famous Dutch people and nothing royal in them. And my own familytree has been thoroughly searched going back pretty far and no royalty eiter... despite the royal name, go figure ;) What we do have in our familytree if I remember correctly is a bandit, mmm... not sure what to think about that, haha. So I guess you are a bit royal yourself, how cool is that?! Ha die Idske, leuk dat je (weer dacht ik?) meedoet! Grappig dat je in Engeland woont, dan ben je dubbel gezegend met royalty ;). Queen Elisabeth II is wel een leuk mens dacht ik he? Zo komt ze op mij wel over tenminste, maar moet eerlijk toegeven dat ik dat niet zo goed weet. Tja, die prins Charles, ben benieuwd wanneer hij de troon mag bestijgen, wel een contrast met Willem-Alexander inderdaad die nog aardig 'jong' is. Hoewel vroeger natuurlijk vorsten echt jong waren vaak en ook nog eens veel macht hadden, bizar gewoon (hoe anders ook dan de ceremoniële rol van onze koning). Enhorabuena por tu nuevo rey!!! Me encantaria participar en tus sorteo, son unas fantasticas minis. Hola Monique, acabo de descubrir tu blog, a través del de Ascensión, me gusta mucho lo que haces y el regalo es estupendo , así que me apunto a tu sorteo y lo enlazo en la barra lateral de mi blog. Thanks a lot for your giveaway, I've just shared the link on my blog's sidebar. If I think about Kings and Queen I think about Middle Age, knghts, battles, romantic stories, Robin Hood etc. But if I think about Italian history, I don't have a very beautiful idea about Kings. Hi Francesca, great to have you in my giveaway again and thanks for the link on your blog! I get what you say about Kings and Queens sounding like something mostly from the Middle Ages (great movies about those - very difficult and often barbaric - times too). It speaks to the imagination a lot doesn't it? In your country it hasn't ended well and I can see why people are very reluctant having that back, since it's associated with a lot of bad things. Thanks for your input! I'd love to enter your giveaway, such pretty little treasures, the handcream is really special and I wouldn't even complain if I received one of your 'failures'! About the King/Queen question, Queen Elizabeth of England is also the Queen of Australia because Australia was a British colony. I think that in this modern world Australia should become a republic. Yes, I can agree with you about Australia and being a colony and why it would make sense making it a republic. That is funny that Denmarks Crown Princess is Australian! And what a nice looking couple and family they are, thanks for sharing that link! I think it's great she's so popular. Haha, I get what you're saying, it's what I was thinking about when people so nicely put a photo and link to it on their blogs, that it does mean more people might enter and lessen the chance for everyone to win. Mmmm... let's keep that quiet and thank you very much for the publicity of course! I have admired your work before and would love to win the tiny tube...super cute. I like Norma live "Down Under" so our Queen is Queen Elizabeth of England. To be honest I don't know what I'd prefer. What I do know is that when I took a class of students to Canberra during the last Queen's visit in 2011 the students were super excited to capture a glimpse of what they thought was a Princess. We really were too far away to actually see her as she was in a boat on the otherside of the lake. The children think though that they saw her Tiara glistening with all its jewels. It was great to see their excitement as this to them was as close to a fairy tale as they could get. I have been watching the news of your new royals on the TV. I just loved all the blow up crowns. (I sooooo want one!!! )Their children looked super cute with their matching atire. Hi IndyPoppy, great to see you again and thanks for entering and sharing the link to my giveaway. Great story about your students that thought they saw a princess (did you later show them a picture of her?) and got so excited about the glimps of her and her tiara, it's stays a magical thing isn't it, seeing a real queen (or princess) in real life, no matter how far away. It's good children of today that sometimes seem to have seen it all already are still mesmerized by that. Those blow up crowns wère great weren't they?? I love them too! You want one for your house? Would make a cool feature, pretty sure you'd be the only one in the world, haha! Nice that you've seen some of the ceremony on tv, great thing about modern times! I'm glad you like my blog and giveaway Felma. Well, with a president like yours, who needs a King? Seriously, I love your president, too bad they have a max. period of 8 years..
Hola me encanta lo que sorteas, si te parece bien me gustaría participar, subo el enlace en mi blog. Con respecto a el tema de la monarquía aquí en España tenemos realeza, aunque la verdad es que últimamente con todos los líos en los que se meten empieza a ser un tanto preocupante, si ellos nos representan por todo el mundo, que pensara el mundo ahora de nosotros. Hola Yolanda, grande, que se inscribe y gracias por publicar un enlace en tu blog! Me imagino que la situación actual de su monarquía no algo (más) para estar orgullosos, lo siento mucho. Esperemos que España en todos los aspectos de forma rápida mejores años. Me gustaría participar en tu sorteo! el regalo es fantastico! En mi país también tenemos monarquia, y yo particularmente no estoy nada contenta con ellos, si no estuvieran mucho mejor. Hola Malu, me alegro de que estés tan emocionado acerca de mi regalo y gracias por poner un link en tu blog! Es muy lamentable, los acontecimientos a su alrededor monarquía, comprensible que usted no es feliz con eso. Perhaps, he should have named his title that way at least it would have been fun. In the university (My specialization is international communication) we learned that Russians have this mentality - to believe in "the king" . That we always need a person "above" to be responsible for all our failures and our well-being. I'm not sure if it's true for most of modern youngsters, but it certainly makes sense. Hi Daria, welcome as a new follower and tnx for placing a link on your blog! And thanks for your compliment, very nice to read you like my writing, means a lot to me :) You have a very nice way of writing too I might add, with energy and joy! Ah yes, I'm a bit familiar with Russia's 'democracy'... a real shame. It's good that you can joke about it, I love that, but it's really sad that that's what your country has to deal with (and everything else a government with those standards stand for entails). Я поздравляю Вас с великим событием в Вашей стране! Это замечательно уважать традиции! Я живу на Украине. Мы лишены счастья иметь старинные и красивые традиции! И это жаль! Для меня король, королева - это сказка. Я хотела бы жить в сказке в реальной жизни! У Вас замечательные миниатюры. Пожалуйста запишите меня! Привет Татьяна, спасибо за поздравления, поздравления и добро пожаловать в мой блог! Что очень жаль, что ваши традиции утеряны .. Благодаря ТВ и в интернете вы можете быть счастливы или насладиться рассказами о царствах других стран и еще маленькую долю в магию его. Congratulations on the new king and queen. I watched the ceremony all day from a Danish broadcasting. The "new" princess Beatrix was wonderful and the new king and queen and the A-team, the little princesses were beautiful. On Friday we had friends from Holland visiting and they saw the Danish magazines with all the pictures from the grand day. In Denmark we have a queen, Margrethe and her son Frederik will be the next king and will have his own, private queen, Mary to support him. They bave 4 beautiful kids. My family and I are Royalists, we will support the monachy always. We love the royal family, they do a fine and wonderful job to promote Denmark in the best way. Well, I hope to win!! Hi Susanne, I'm happy you like my giveaway and welcome! How nice that you saw the ceremonies of our king & queen. She was, wasn't she, our Princess Beatrix, she looked so relaxed now in her new role, and I already thought she was great. And those girls, very adorable girls. Thanks to Norma I've seen your king to be with his wife and kids, very nice family. We're fortunate to have such nice kingdoms in Danmark and Holland. You have a great spring and summer too! Gracias Ángeles, buenos para leer que usted sea feliz con su rey! Es genial que te unes a mi regalo, le doy a todos ustedes, lamentablemente, sólo una victoria .. Éxito! Yours things are beautiful. Sorry by my english. I would to participate in your giveaway. I watched yor new king by TV. I'm from Spain and we have a king too. Thank you Isabel and I understand your english just fine. Nice that you saw our king on tv, it's so great events like this can be shared with the world this way. Now, I became a follower of your blog. Sorry. I don´t know what I did yesterday about this. Hello Monique! Ik zou graag meedoen aan jouw leuk giveaway! Jouw link is al lang op mijn blog! Ik heb verleden week Willem Alexander en Maxima op Nederlandse televisie gekeken. Bonjour Noelle! Wat leuk dat je al een link op je blog had, dank je wel. Wat jammer dat jullie koninklijke situatie wat moeizaam is, met een koning die toe is aan aftreden, maar de opvolger nog niet voor zijn kroning en Belgie zo moeilijk te besturen. Ik hoop met jou dat koning Albert het nog een tijdje vol houdt. Leuk dat je ons koningspaar op tv hebt gezien, leuk stel he? My son's 16th birthday is May 21st! so maybe I'll get lucky. ;) The miniatures that you make are absolutely adorable! Where I live, we have a president. thank you for putting a link on your blog! In Italy we don't have a king or a queen since 1946 when Italian people chose between Republic and Monarchy in a referendum where were, for the first time, involved Women. It was June 2 and every year we celebrate our Republic :) So we have Republic's President! Hello! :) Just became a follower... and I would LOVE to be a part of the giveaway!!! Hi Lindsey, welcome to my blog and thank you for entering my giveaway (and being so enthousiastic about it ;)) It does sound fancy doesn't it, King & Queen sounds like something special. And I can understand it's difficult to say what you prefer, I also doubt that a king or queen would change the education in your country..
op het nippertje... Ik wil heel graag meedoen met je giveaway. Prachtige mini´s heb je weer gemaakt!!! Ik woon in NL, dus ze zijn ook mijn koning en koningin :-). Ik zal de link op m´n blog zetten. Hi Lara! Leuk dat je ook meedoet, net op tijd inderdaad! Met 1 dag vertraging ga ik vandaag de trekking(en) doen.